Police Constable Matt Rigby and his partner Lowry Dairsley, from Salford, Greater Manchester, were expecting their third child, nothing unusual there. But then a coincidence happened where the odds of it actually happening were something like 300 million to one. 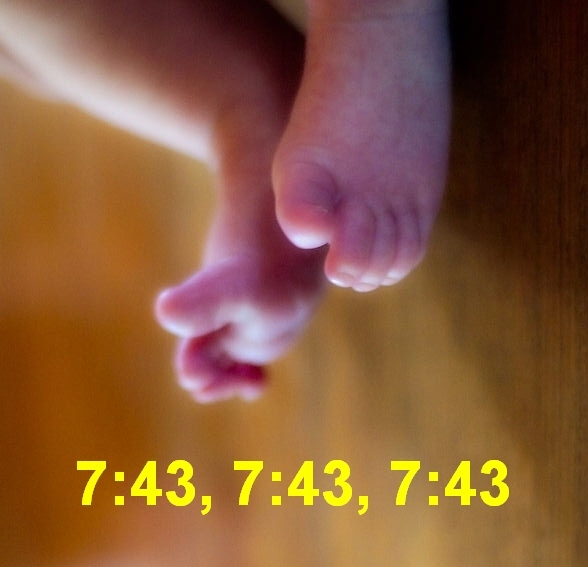 The couple's first two daughters were both born at the same time of 7:43, Ella in October 2005 and Evie in 2007. "When we found out I was pregnant with Harrison we joked it would be incredible if the same happened. When I went into hospital at 5pm we forgot about it and concentrated on the labour. At 6.30am I felt the urge to push and when we next looked it was 7.41am. I was asked to wait for the next contraction by the midwife before she delivered him two minutes later. The doctors and midwives were speechless." Matt added, "I looked at the clock it was 7.43. We couldn't believe the coincidence." Wow, this one is stunning. Same birth dates for kids in a family, okay, that's unusual, but this?? Thanks for the comments - Trish & Rob, Tom and Melissa - must admit this story impressed me as well! !